By its failure to stop homes from turning into hotels, the City Council is eroding the separation between residential and commercial zones and allowing much-needed housing units to disappear from the market. The explosive growth of short-term vacation rentals in recent years has exposed the failure of our city’s leadership. San Diego’s mayor and Council have looked the other way as houses and apartments were taken off the market for residents and converted into mini-hotels for tourists. 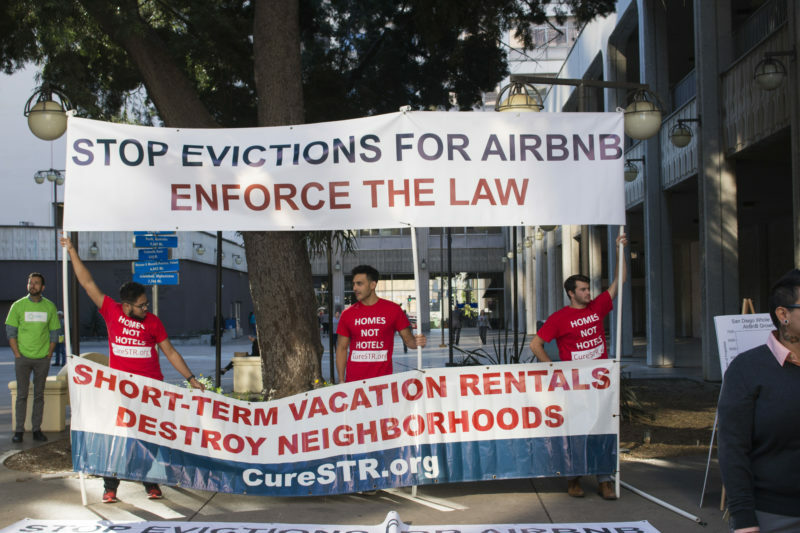 More than 11,000 units have been lost to short-term vacation rentals, most of which are “whole home,” according to data compiled by Host Compliance, a San Francisco company that monitors the industry. And that loss of residential housing is growing rapidly. It’s now easier to find a short-term vacation rental in a residential neighborhood than it is to find a long-term rental. Neighborhoods in every corner of the city, not just the beaches, can expect to see their residential housing stock diminish as these mini-hotels proliferate unchecked. People are waking up to the impact these rentals have on our neighborhoods, and are finally understanding that it’s not just about nuisance complaints — it’s about the already scarce residential housing we’re losing. In a city that only builds an average of 3,000 new housing units a year, we lost 2,000 housing units to short-term vacation rentals in 2017 alone. Anyone who claims to be a proponent of building more housing to help solve the housing crisis should also be an opponent of short-term rentals. Coupled with the conversion of affordable housing into market-rate housing, most recently in PQ Village, the rapid loss of homes to Airbnb mini-hotels means we are playing a game of one step forward, two steps back. And not surprisingly, when short-term rentals displace residential homes, the cost of housing rises for everyone. Make no mistake, none of this is inevitable. Airbnb and the short-term vacation rental industry is not the same as Uber or dockless bikes. “Disruptive” new industries don’t get to disrupt the rule of law. This issue is not about the “sharing economy” or any other manipulative jargon out of Silicon Valley. It’s about the well-established laws of land use and residential zoning. In fact, the 1926 Supreme Court case affirming the constitutionality of zoning laws was based on a challenge from a commercial enterprise that wanted to operate in a residential zone. The court wisely decided that cities have every right to keep residential neighborhoods for residents only. Short-term vacation rentals are illegal in San Diego, plain and simple — despite our mayor and Council’s refusal to enforce the law. They don’t belong in our residential neighborhoods any more than meth labs. The latest plan by Mayor Kevin Faulconer to legalize short-term rentals will only make the situation worse. His plan reportedly limits short-term rentals to one owner, but it’s not hard to imagine investors exploiting legal loopholes and creating galaxies of shell companies to hide their true ownership, while they snap up more and more residential housing units. My opponent Chris Cate’s plan is no better. He’s proposed a permitting system that would legalize the conversion of residential housing to short-term vacation rentals. His plan to have a “three strikes” system to regulate nuisance short-term rentals would be near impossible to enforce and rings hollow considering his failure to call for enforcement of the existing law for the thousands of illegal units already on the market. Indeed, Cate’s plan to legalize short-term rentals is exactly what the industry wants, and he seems to be putting the interests of donors ahead of constituents. Cate has taken thousands of campaign dollars from Airbnb lobbyists and the owners and employees of companies like Seabreeze Vacation Rentals, Bluewater Vacation Homes and Nancy’s Vacation Rentals. We can sell out our community to the vacation rental industry — or we can fight back to protect our residential housing. San Diego must aggressively enforce the zoning laws already on the books, as many other coastal cities have already done in California. Residential neighborhoods are for homes, not hotels. Matt Valenti is an attorney and a candidate for San Diego City Council’s Sixth District. See anything in there we should fact check? Tell us what to check out here.